Brett Moist/ For the Northwest Herald Mchenry's Korey Partenheimer (right) intercept's a pass intended for Cary Grove's Kaene Connington (left) during the 1st Quarter of Gameplay at Mchenry High School on Friday. Mchenry's Dennis Quitilag (back) was in pursuit. Cary Grove defeated Mchenry 42-3. 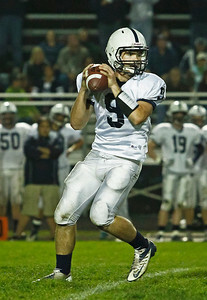 Brett Moist/ For the Northwest Herald Cary Grove quarter back Quinn Baker gets ready to throw a pass during the 2nd Quarter of Gameplay at Mchenry High School on Friday. Cary Grove defeated Mchenry 42-3. 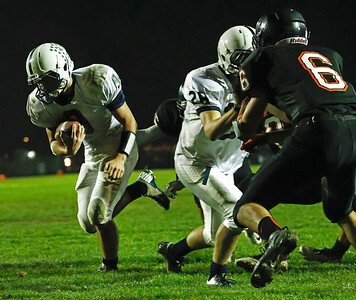 Brett Moist/ For the Northwest Herald Cary Grove quarter back Quinn Baker runs past Mchenry's Micah Kohn during the 2nd Quarter of Gameplay at Mchenry High School on Friday. Cary Grove defeated Mchenry 42-3. 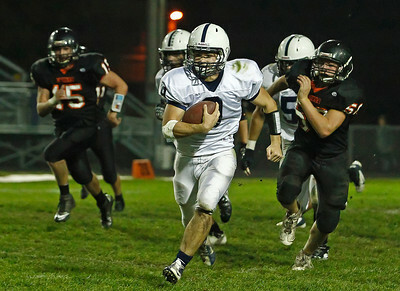 Mchenry's Garrett Glueck (left) was also in pursuit. Brett Moist/ For the Northwest Herald Cary Grove quarter back Quinn Baker runs past Mchenry's Garrett Glueck during the 2nd Quarter of Gameplay at Mchenry High School on Friday. Cary Grove defeated Mchenry 42-3. Brett Moist/ For the Northwest Herald Cary Grove quarter back Quinn Baker runs past Mchenry's Marcus Thimios into the endzone for the touchdown during the 2nd Quarter of Gameplay at Mchenry High School on Friday. Cary Grove defeated Mchenry 42-3. Brett Moist/ For the Northwest Herald Cary Grove quarter back Quinn Baker runs into the endzone for the touchdown during the 2nd Quarter of Gameplay at Mchenry High School on Friday. Cary Grove defeated Mchenry 42-3. Brett Moist/ For the Northwest Herald Mchenry's Jake Braskett tries to run past Cary Grove's Danny Nick during the 3rd Quarter of Gameplay at Mchenry High School on Friday. Cary Grove defeated Mchenry 42-3. Brett Moist/ For the Northwest Herald Cary Grove's Kasey Fields runs past Mchenry's Jake Huffman during the 3rd Quarter of Gameplay at Mchenry High School on Friday. Cary Grove defeated Mchenry 42-3. Mchenry's Jake Braskett tries to run past Cary Grove's Danny Nick during the 3rd Quarter of Gameplay at Mchenry High School on Friday. 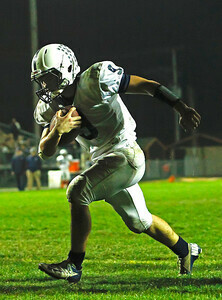 Cary Grove defeated Mchenry 42-3.